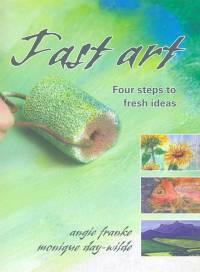 If you’re feeling creative but don’t have much time on your hands, Fast Art by Monique Day-Wilde and Angie Franke is the perfect solution. With 50 art projects ranging from fabulously fast (finished in a flash), fairly fast (in a few hours) and fast, you can take your pick and finish in no time at all. This is a no-nonsense book. There aren’t any tedious introductions to read or hefty chapters to browse through before getting down to the nitty-gritty. It starts with a short explanation of how the book works: choose a project from one of the three time constraint sections, flip to the back for a glossary (if you need to brush up on some terms) and then get going. There is also a section on colour and colour mixing, and some useful lists to help you minimise prep time so you can get started in a jiffy. Now we get to the exciting bit! If you choose the “Fabulously Fast” chapter, expect to find projects that can be finished in a flash. Use wax and Styrofoam to create interesting pieces, or try monoprinting. The “Fairly Fast” chapter introduces you to mixed media – learn how to create textures using tea bags, pattern paper and plaster of Paris. Finally, “Fast Art” is about the bigger pieces – make stone carvings and plaster models of your hands, use clay to make cute tiles or try glyph engravings. Each project is given a two-page spread. All projects are explained in four easy steps, accompanied by progress photos. The finished product is shown off with a whole-page photo. This layout showcases the finished product, and makes the tasks look easy and manageable. The great thing about this book is that it introduces you to new techniques. Although the finished product is guaranteed to look amazing (Angie and Monique make sure of that) it’s the art-making process that looks like the most fun.